If you are a regular reader of this blog, as well as noticing how behind I am in my blogging endeavours (Quinten’s 365 anyone!!?) you will know that we are currently doing an elimination diet with Reuben, after he was given a borderline diagnosis of Eosinophilic Eosophegitis. Last week was EOS awareness week, an initiative run by a fantastic organisation called AusEE, that aims to raise awareness and money for education and research into Eosinophilic Disorders. Anyway, one of the ways to fundraise was the ‘Top 8 Challenge’, which we registered for. Our family committed to eat top-8 free for an entire day (the 8th of August), and friends and family could sponsor us. So basically, we went the whole day with no dairy, gluten, soy, eggs, fish, shellfish, tree nuts or peanuts. All of which, along with corn, Reuben has been without for the last few months now. We are trialling corn at the moment, which means we really are only off the Top 8 at the moment, so that worked out well! I wanted to share our day here. 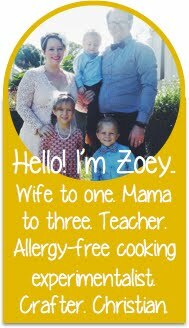 Creating allergy-friendly food has become somewhat of a second nature to me.. I read a recipe and automatically start to ‘translate’ it in my head… I can use coconut oil instead of butter… sunflower seeds instead of almonds, tapioca instead of cornflour, chia seeds instead of eggs… Reuben eats well… he eats interesting and varied foods and meals, and I have managed to find ways to recreate most of his favourites. So with that experience under my belt I was confident in going into this day. It was trickier for our friends. You see we decided that to make Top 8 Day a day worth celebrating we would end it with a dinner party in honour of Reuben. I was so excited at the thought of a meal with friends where Reuben was free to eat absolutely anything that he wanted to. So we invited our friends to join the challenge and bring along a Top 8 Free meal to share. We started the day with gluten-free weetbix. These are new from Sanitarium, made from sorghum, and taste close enough to their wheat counterpart to make my weetbix-loving-and-missing boy very, very happy. We served them with rice milk. Which was also in our coffee. The kids did not have coffee… Mayana had rice milk and Reuben had his neocate. None of us other than Reuben really like rice milk very much at all, but the weetbix were okay! Mayana took a Top 8-Free lunchbox to school. She had a Sinchie with apple puree (we love those things), everything-free baking, rice crackers, corn cakes with ham & nuttlex, cucumber, grapes and dates. Reuben and I had chocolate brownies, medjool dates, corn cakes and banana for morning tea. Lunch was some delicious leftovers. Pete invented this very yummy top8-free carbonara with rice pasta. Quite delicious. Afternoon tea was apricot-date squares (made by blitzing dried apricots and dates, and shredded coconut), a coconut ‘chocolate’ fish, and potato bread with blueberry jam. The potato bread is a new find, and one of the few gluten-free breads I’ve come across that contains no soy or egg. It does have corn, so we’ve only been able to buy it since the corn trial. It’s very expensive, but as far as texture and taste goes it’s probably the best gluten free bread I’ve tasted. Also, it’s made locally on the Sunshine Coast, which is pretty cool. Dinner. Well. Our friends completely outdid themselves and we enjoyed an allergy free feast of epic proportions. We had amazing soups, Asian-inspired noodles, sticky rice with delicious curries… a feast fit for a king! When I told Reuben that our friends were coming over for a special dinner and he could eat anything he wanted to he got very excited. “Party? Me?” he asked? I think he thought it was his birthday, hehe. But yes, we did have chips and cake! And dessert. Oh yum. I made a chocolate self saucing pudding with whipped coconut cream. It was very popular, and I should have at least doubled the recipe. We also had coconut rice pudding with strawberries and peaches, and coconut caramel custard with banana. So much yummy. And that was it! Our Top 8 Free Day. We succeeded, we didn’t go hungry, and we actually enjoyed our food. And to top it off, we have raised over $300 for AusEE, which is pretty fabulous given that our initial fundraising goal was only $150. I’d call that a great success for our very first Top 8 Challenge Day. Thank you so much to all our friends who sponsored us, and who joined us on challenge day.